The world is at your finger tips when it comes to service carts. 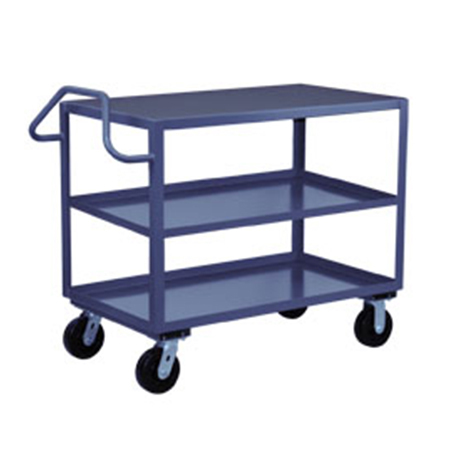 Standard service carts are used in a multitude of workplaces and have evolved over the years to meet workplace demands. If we can’t find what you need then we will make it! Standard cart widths include 18”, 24”, 30”, 36” and can be made in lengths up to 72” and longer. The number of shelves is really determined by the carts intended use and overall height, but two and three shelf carts are common place. Capacities vary, plastic service carts hold about 200 lb on average while the all-welded steel service carts can hold weights in the range of 1,000 – 4,000 lb. Another option to consider when looking to purchase a service cart is the style handle. Whether it be a straight handle, raised handle, or an ergonomic handle we have what your looking for. With all this thought going into the cart, you know we couldn’t put any old caster on. Choose your casters diameter, capacity, composition as well as its ability to swivel and lock.